The Counterfeiters is the dramatic depiction of the struggle for survival, honor and principle by a special unit of concentration camp prisoners. That it is based on memoirs written by one of the prisoners, makes The Counterfeiters even more compelling. Salomon Sorowitsch, known as Solly, is a notorious swindler and forger, living the high life in pre-World War II Berlin, confidently ignoring the threatening storm clouds of the Nazis, when he is arrested by Police Inspector Friedrich Herzog. As a habitual criminal and a Jew, Solly is shipped off to the terrifying and brutal Mauthausen concentration camp, where he subsists by his wits and by painting flattering portraits of the Nazi guards and their families. Suddenly and mysteriously, Solly is transferred to the Sachsenhausen camp by none other than his old nemesis, Herzog, who is now heading a secret commando unit of 142 prisoners who must produce mass quantities of fake British Pounds and American Dollars. The Nazi’s audacious scheme, “Operation Bernhard,” is to ruin the British economy by flooding that country with fake British Pounds and to buy needed weaponry and supplies with the bogus U.S. Dollars. Herzog places the group in the “Golden Cage” barracks that are separate from the rest of the camp, with clean sheets, decent food and background music as well as a fully-equipped counterfeiters’ workshop—all the better to induce maximum performance from the prisoners. An “enlightened” Nazi, Herzog does not physically maltreat them; he doesn’t need to. He merely opines that it would a shame if they failed and were sent to the gas chamber. Of course, the prisoners realize that, in any event, they will be killed once they have completed their work. The Counterfeiters, intelligently, believably and at times heartbreakingly explores how the diverse members of the group react to their plight. How can they bear the reality that their treatment is princely compared to the beastly conditions they see and hear in the rest of the camp? Should they, as Solly believes, pragmatically cooperate with the Nazis to stay alive, or should they sacrifice their lives in an idealistic attempt to revolt or sabotage the operation, as Solly’s friend Burger, advocates? Should they risk their own lives to support each other, or should each do whatever is necessary to save himself? In one unnerving scene, Solly is manhandled into a truck without explanation. In mortal fear, he is lead off the truck at its destination, only to find himself at Herzog’s country villa. Looking like the poster boy of Nazi health and contentment in his white tennis sweater, Herzog bounces down the drive to greet his “guest”, who is haggard, thin and disorientated and wearing the ragged suit of a gas chamber victim. These two polar opposites sip tea while they negotiate a temporary symbiotic détente…each making a deal with the devil. The Devil’s Workshop (Des Teufels Werkstatt), the memoir on which the film is based, was written by the now 90 year old Adolf Burger, who also tells his story to audiences around Germany. Although his book does not seem to have been translated into English, the book, Krueger’s Men: The Secret Nazi Counterfeit Plot and the Prisoners of Block 19 by Lawrence Malkin (Little, Brown and Company, 2006) may be of interest. The character of Solly was loosely based on a notorious counterfeiter named Salomon Smolianoff, who seems to have disappeared at the end of the war, after he supposedly was seen at the tables in Monte Carlo, losing heavily. Smolianoff is also believed to have helped forge papers for Jews trying to emigrate to Palestine. He died in Argentina in the 1960’s, after living off the “rediscovery” of some Old Master paintings. Acclaimed at the Berlin, Telluride and Toronto Film Festivals, and nominated for an Oscar for Best Foreign Language Film, The Counterfeiters combines nuanced acting, particularly by Karl Markovics, as Solly and August Diehl as Burger, wonderful direction and an intelligent screenplay by Stefan Ruzowitzky that analyses complex moral issues, while it keeps our hearts racing with its suspense. I generally avoid seeing movies about Nazi concentration camps, having sobbed through too many of these brutal films. 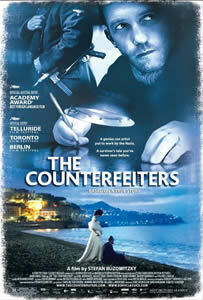 But the powerful, gripping, yet multifaceted and largely true story of The Counterfeiters is a film not to be missed.